Hey, I don't really use this blog anymore! This is an old post. I didn't publish it way back when, because the situation was still very charged, and I didn't want to make it all about that one specific interaction. But, we've moved on now and I think there are some general points here worth sharing and discussing. So here it is. A few interactions in one of the weekly games I'm in has highlighted some issues of trust in roleplaying so I figured I'd say a few words on the subject. "As the GM, I describe the failure." "Right. But you can't just say anything, right? It has to suit the character and not violate the player's vision, and it has to make sense with what has come before and..."
"Uh, that's not what the rule says. It says the GM describes the failure. Here's the actual text: 'Every so often, you’re going to lose control of your character for a moment. When you attempt to do something and fail your test, the GM gets to take over and describe something that went wrong. He can tell everyone about something you did that was misguided or even bad. Or, he can describe an unforeseen effect that your actions caused. He gets to stick it to you for a moment.'" "Well, sure, that's what the book says, but you still have to make sure it's okay with the player and doesn't mess up their idea of the character..."
And that's when I realized that the player -- on some deep level -- just didn't trust me, as GM, to "do it right" when it came time to take control of their character on a failure. And not just their own character, but any PC. "Yeah, I could have my character really go down this dark path..."
"But that's not great for the story, though. It's one dimensional to have a character that just spirals down like that." "Yeah, well, that's where I see this going." "I know, but it makes a weaker story that way. One-dimensional characters are boring..."
Again, the trust just isn't there. The PC going down this dark path is "doing the story wrong" (as if that was possible) or at the very least, making the story somehow worse. The objecting player has certain standards that must be honored, or his enjoyment of the game will suffer -- which is perfectly normal, of course -- but he doesn't trust the rest of us not to mess it all up for him. As a result, we often end up debating the merits of player decisions, story points, NPC behaviors, and rules applications whenever any of them begin to diverge from the standards and preferences of this player. He's worried that we're going to weaken the story, make a critical error, do something that doesn't "make sense," or otherwise disrupt the fictional space inside his head. On some level, He just doesn't trust us to get it right. When the trust is there, there's no need for lots of front-loaded debate and discussion before establishing the action. A fellow player does something that seems odd or the story takes a bizarre turn or a rule is applied in an unexpected way and it's okay. If you trust everyone sitting around the table, you can take a wait-and-see approach. Maybe it seems a little odd or unexpected now, but you trust that it will all work out. You give the benefit of the doubt. When the trust is there, everyone is free to play hard, be bold, and put their stamp on the game. Their vision might be different from your vision, and that's okay. Playing with trust means coming to the table excited to hear what the other players are going to say -- whatever it may be. That's why we play these games with particular people, right? That's why we stay in groups with creative, interesting, engaging players and leave the groups that don't click for us. Sure, sometimes you need to be firm and hold your ground. Sometimes you fight for your specific vision of the game. But when it comes from a place of trust, you're fighting with your respected peers. You're advocating for your ideas, not shooting theirs down. When it's not based in trust, you're trying to shepherd the other players -- steer them, guide them, show them the right way. You're fighting to protect yourself from their "bad ideas." I'll say that again: You're fighting to protect yourself from the so-called bad ideas of your fellow players. If you're in this place, it's time to reassess. Do you really want to be playing with these people? Maybe play with people you trust more. Do you really want to trust this group, but find it hard to? Maybe press on and try to release the iron grip of control. Also, consider this question: What did these people do to lose your trust? Often, the answer is "nothing." The lack of trust may be coming from past experiences or other issues. Try to give your fellow players the benefit of the doubt. Relax, and fly casual. The thing that seems so wrong or strange to you right now may turn out to be really cool if you allow your fellow players to take risks and be spontaneous. 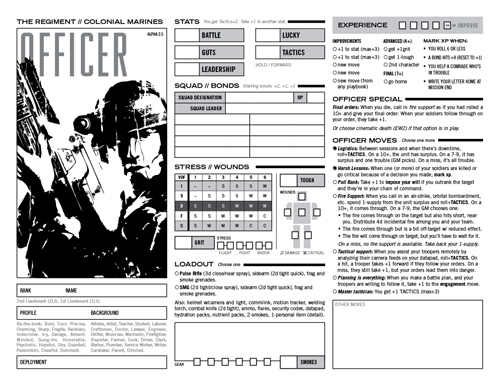 The version 2.5 playtest kit for The Regiment: Colonial Marines is ready. A slightly simpler game: I reduced the overall number of moves as well as removing some exceptional cases so it’s easier to remember and apply rules. Fictional results for stress and wounds: In previous versions, it was easy to gloss over the effects of stress and wounds, falling back on shorthand: “Take 2 wounds.” I wanted each box of damage to have a specific effect to cue a result in the fiction. More difficult choices: Tough choices are always fun. I revised the old push yourself move into something more interesting (I hope): Keep it together. The engagement move now accounts for details of the specific situation, including morale elements, so choices of fictional positioning have a bigger impact when making that move. New volume of fire table: There are now 5 VOFs: Incidental, Scattered, Direct, Focused, and Concentrated. New stress system: Each time you take stress, you choose how your solider will react to it: Flight, Fight, or Shock. New wounds system: Wounds have locations now, and critical wounds take you out of action. There’s a critical move that determines how badly you’re injured, so there’s more uncertainty (you can’t count on a 2d pistol to not kill you). New and revised moves: Assault now includes covering fire. Push yourself has been revised into keep it together. Help has been revised into aid. Hit the deck no longer requires a roll. New critical move. Rally is now a Sergeant move. New and revised playbook moves: Changes to each playbook! Give them a close look. Also check out when you mark xp (upper right corner of playbooks). Thanks for checking it out! If you give it a try, let me know here, on G+, or at the Regiment forum. As always, I'm happy to answer questions. Also made a few minor text tweaks here and there. EDIT: Also updated the InDesign file package. Here's the map we're using in our game. You might want to make your own, but if not, click on the preview for a printable hi-res version. 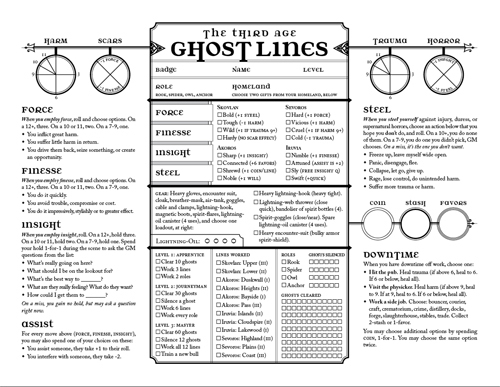 Here's an updated version of Ghost Lines, now with credits, instructions on leveling up, rolling the dice, lightning-oil usage, and some minor tweaks. Thanks for the feedback, everybody! Also, if you want to hack it, do a translation, or whatever, it now has a Creative Commons license (CC BY-NC-SA). And here's the InDesign file package. Hey there. This is what I'm designing/running right now. It's a 3-page micro-hack based on Apocalypse World, Dishonored, and Ghostbusters. 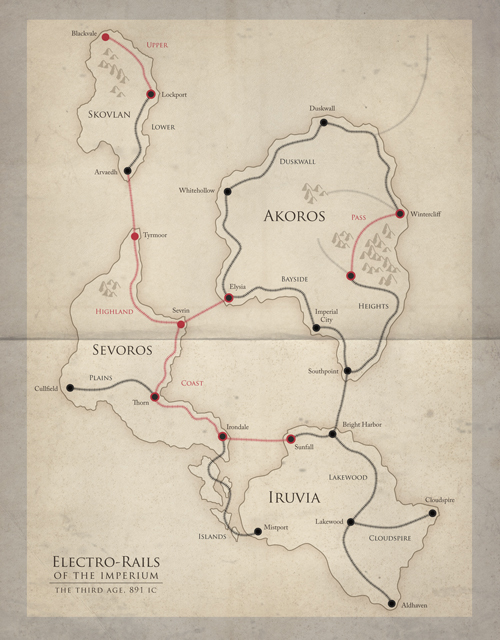 Our World of Dungeons world got destroyed in a supernatural cataclysm, so we decided to move the timeline forward 1,000 years and play a new game. This is the result. It might be playable by people who aren't us, who knows? I figure some of you will probably want to give it a whirl. I'm happy to answer questions. Grab the PDF for new playbooks, weapons, vehicles, and a starter mission by Ryan Dunleavy. We're also trying out a few new rules, including death moves and a "cinematic death" option (like debilities in Apocalypse World). 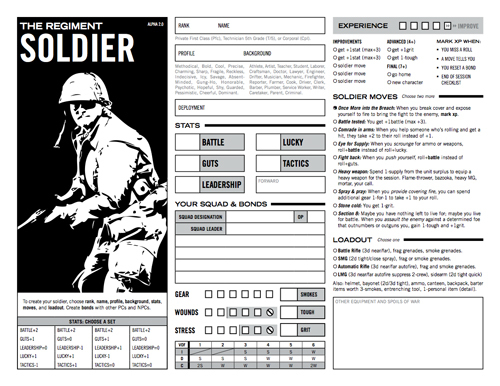 Like all playtest stuff for The Regiment, this is a very bare-bones kit. You'll need familiarity with Apocalypse World and the Aliens universe to use it. If you give it a try, or have any questions, head over to the Regiment forums and let us know. I made a few tweaks to The Regiment for BurningCon 2012. They were a big hit, so now you get to try them out, too. - New "Medic!" move that's all about the hard choices. - New "Lead the way" move for the Sergeant that is super-badass, and gives the SGT a reason to put all those eggs in one basket. - Operator only gets one additional move to start, not two. - "Are you crazy?" move rolled into new move, "Combat action." - "End of session checklist" move added. - Advice callout box added to GM2, about not getting bogged down in planning. 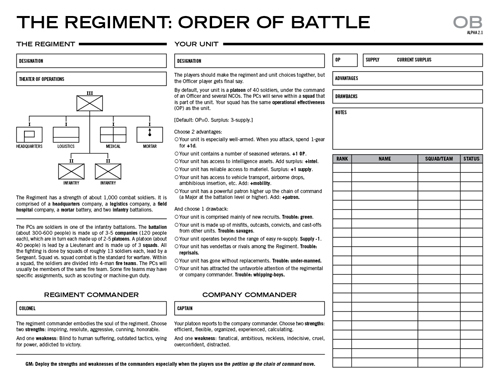 - Regimental and Unit order of battle sheet added. The alpha 2.0 playtest kit for The Regiment is here. - Single-sided, 8.5x11 playbooks. A bit simpler now and ultra-compact! - Revised and standardized advancement across all playbooks. 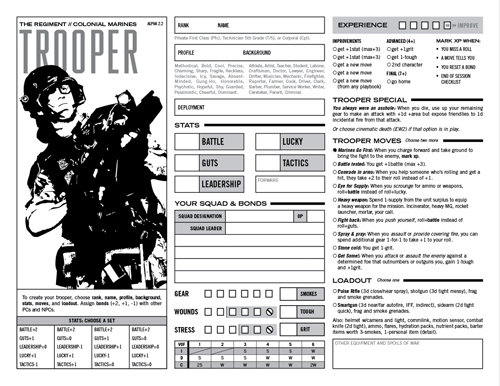 - Added new modern era special forces Operator playbook. - Completely revised moves, both in the playbooks and in the basic set. - Revised weapon ranges and damage. - New battle plan mechanic, similar to workspace from AW. - New unit maneuvers mechanic, to gracefully handle off-screen and NPC actions. - The new Unit creation sheet. You can use the old one for now, and use "profile" for "operational effectiveness" in 2.0. Go ahead and grab it, give it a try, and let us know what you think over on The Regiment forum. Thanks to all the alpha 1.0 playtesters and fans for your help and support.